We can create a beautiful, customized deck that adds value to your home and will last a lifetime. Our customer service is second to none. We are committed to you and your complete satisfaction. If you are considering expanding or improving your outdoor space, we've got you covered. We specialize in transforming existing homes by adding beautiful outdoor living spaces. You can trust us because MY DECK is a 10 time national and New Jersey deck winner. We pride ourselves in transforming homes by creating beautiful outdoor living spaces to enhance the overall look and value. We specialize in custom decks, patios, walkways, railings, awnings, pergolas, and built-in outdoor kitchens and grills. We carry the TrexPRO Platinum designation. This is the highest rating offered by Trex. We specialize in decks, patios, walkways, railings, and built-in outdoor grills and kitchens. 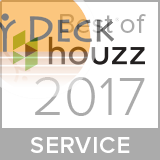 With years of experience in the business, our team of local deck builders and contractors are the ones to call. Our online project management system allows access to your plans, documents, schedule, warranty management, change orders & everything relevant to your project. MY DECK proudly serves the local New Jersey communities of Flemington, Raritan, Hillsborough, Milford, Alexandria, Clinton, Neshanic, Franklin, Rowland Mills, West Windsor, Princeton, Mendham, Somerset, Bridgewater, Bernardsville, Kingwood, Frenchtown, Lebanon, Annandale, Lambertville, Hopewell, Plainsboro, Kendall Park, Somerville and Readington NJ. My Deck did an outstanding job designing and building our three season room and deck. A quote directly from our township inspector - "They don't make decks like this anymore". Bob and his team exceeded our expectations.